& stop by both of their pages and check out the fantastic art from both of them. The FINAL Inkwell Awards Summer Blowout Auctions! There are several relisted items ranging from as low as $0.01 to $1.49, we also have a CGC Signature Series 9.8 graded 2012 Inkwell Donation Book signed by Mike McKone! As well as a multi-signed 2012 Inkwell Donation Book signed by Mike McKone, Jim Tournas & Bob Almond! 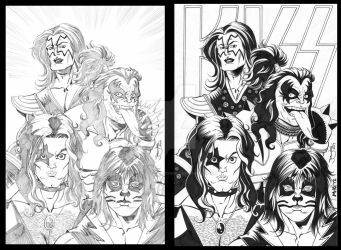 Be sure to stop by and get everything from signed prints to signed books to original art at extremely low prices! This will be the last auctions from the Inkwell Awards until early October 2012, so be sure to visit our eBay store! MY INK WORK IS OFF-LIMITS AS OF 08/01/2011 TO USAGE OF ANY KIND WITHOUT EXPLICIT WRITTEN PERMISSION. PLEASE *ASK* ME IF YOU CAN COLOR SOMETHING AND I WILL GET BACK TO YOU. Modification of my work for your own purposes and without my permission is not allowed and is considered theft. My work may not be used for profit by another person without an agreement with me. ONLY & & have MY PERMISSION to color my inks. Please avoid spamming my user-page with chain letter related comments, thanks! 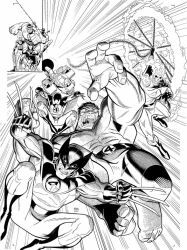 In January 2009, Michael would find another way to serve Veterans by becoming an inker for Heroes Fallen Studios with good friend Clayton D. Murwin. Lastly, March 2011 would see Michael join the ranks of Inkwell Awards first as a Contributor and then as a Committee Member in June of the same year. Michael enjoys family, time cooking restaurant quality meals, cycling, watching football & baseball, reading comic books, drawing, watching movies and television. Michael's favorite TV shows are 1966 Batman, Big Bang Theory, Supergirl, Flash, Black Lightning, Star Trek: The Next Generation and Discovery, The Resident, The Good Doctor, and 9-1-1. Michael's favorite sports teams are the Miami Dolphins (NFL), Miami Hurricanes (NCAA), Charlotte Knights and Kannapolis Intimidators (MiLB) as well as the Texas Rangers (MLB). Michael also, enjoys music, his all-time favorite band is KISS, and is a fan of the hair bands/rock of the 1980's from his teenage years. He is also a fan of old school wrestling from AWA, WCCW, WCW, and WWF. Michael has 3 wonderful children, Michael (21 years old), Dustin (19 years old), Ashley (17 years old). Michael also has a wonderful wife of 10 years, who has 2 wonderful sons, Chris (28 years old) and Cory (18 years old) and they have 2 fur-babies (rescue dogs), Jethro and Spike. 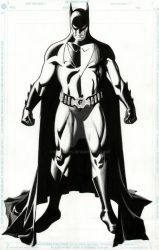 Sep 8, 2012 The FINAL Inkwell Awards Summer Blowout Auctions! Jun 1, 2012 Comic Book Inking? AAU? Fall 2012? Apr 12, 2012 Happenings around Inkwell Awards! I colored one of your inked pages. How do I have it appear on your and creaturesink's pages?